Sigvard Bernadotte (1907 - 2002) was a Swedish prince, the second son of King Gustav VI of Sweden. He was also the brother of Queen Ingrid of Denmark. As a young man, he wished to become an actor, but his father and grandfather were against it. Thus deterred, he went on to study art history at Sweden’s Uppsala University. His interest in drawing and painting developed during this period and, in 1929, after completing his degree at Uppsala, he enrolled in the School of Decorative Arts, in Stockholm. In 1930, he attended the Stockholm Exhibition and was greatly affected by what he saw there. Bernadotte’s connection with the Georg Jensen Silversmithy began in 1930. 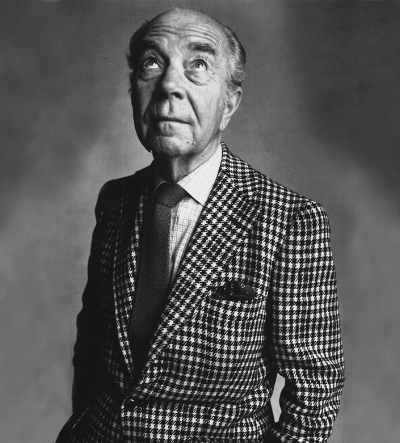 His talent as a designer was recognized by Jorgen Jensen, Georg Jensen’s second son who was then living in Stockholm, and by Niels Wendel, a Swede who was a partner in the Jensen firm. Wendel passed along a recommendation to the Silversmithy general manager and Bernadotte was offered a contract to design for the company. The designs Bernadotte created for the Silversmithy represented a completely new look for the firm. Thoroughly modern, they are characterized by an emphasis on form. Bernadotte had a predilection for classic geometric shapes, especially cylinders, funnels and spheres. There is also a strong element of streamlining in his work. Ornamentation is restrained and is generally confined to straight, often parallel, incised lines. His work, which is readily identifiable, consistently exudes a cool, understated elegance. Excerpt from Georg Jensen Holloware, The Silver Fund Collection.